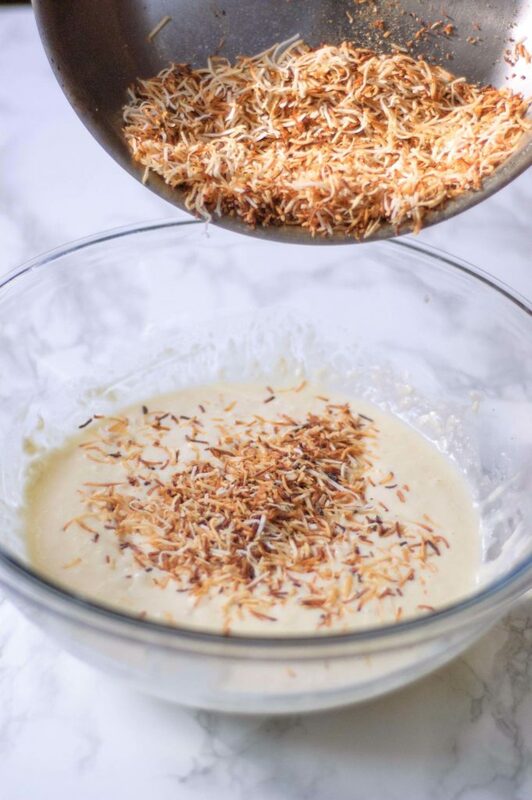 Start your morning off on a great note with these perfectly sweet Chocolate Chip Pancakes with Toasted Coconut. They have just a hint of coconut flavor, but a few simple substitutions can really make the coconut flavor shine! Note: This post was updated on August 27, 2018 with new content for your enjoyment. I love this recipe. It’s so easy to make and really easy to gauge when the chocolate chip pancakes are done. It’s perfect for an anniversary, special weekend breakfast, or a birthday treat. (I love using them for a smash cake alternative!) They feel super special but they aren’t loaded with extra sugar. This makes this chocolate chip pancake recipe ideal for any morning of the week. Half of making a really good chocolate chip pancake, is having a perfect pancake batter. These posts explain how the ingredient impact the pancakes. This is especially true of the flour. Understanding the Different Types Of Flour. Learn why I chose the flour I did and how to make your pancakes even lighter and fluffier. What Eggs Do In Baking. Learn how the eggs we use in this recipe affect the texture, flavor, and the way it cooks. How to Buy & Store Eggs. Learn the grocery store lingo for buying eggs and how long they are fresh. 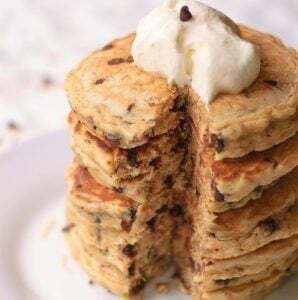 You can store leftovers of these chocolate chip pancakes in an airtight container in the refrigerator for up to five days. If they are still warm when you put them in the fridge they stick together. You can offset this by placing a square of wax or parchment paper between them first. Place your pancakes on a parchment paper or silicone mat lined sheet pan. Cover the pan loosely with aluminum foil and bake for 10 minutes or until the pancakes are warm. If you’re up for making a large batch, these pancakes freeze beautifully. Here’s my one warning though. If you reheat them in a toaster or toaster oven, the chocolate chips might burn. Being so close to the heat source puts them at risk. Keep a closer eyes on these than you would a standard pancake. To freeze chocolate chip pancakes. Place the pancakes in a single layer on a sheet pan. Try to keep them from touching. Freeze for 30 minutes. Remove your chocolate chip pancakes from the freezer and layer them between pieces of parchment paper in your storage container. Make sure that the paper is larger than your pancake to prevent sticking. Freezer bags work great for storage, but don’t forget to label it first! 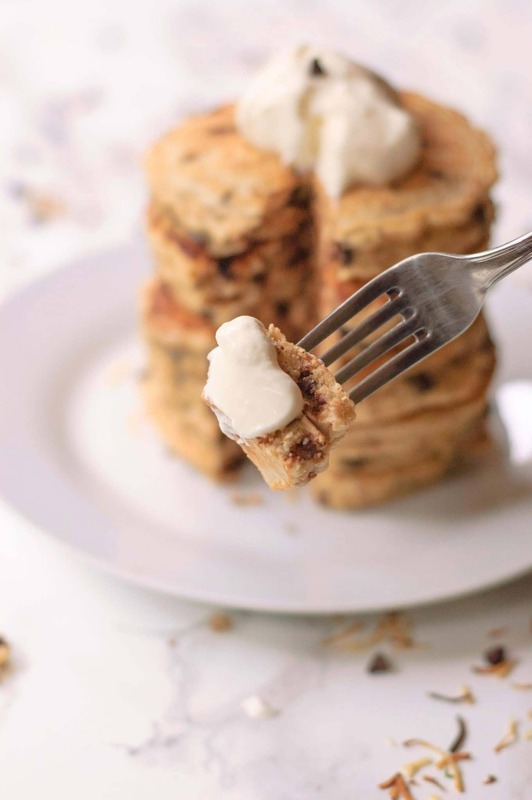 This chocolate chip pancake batter in this recipe is very thick. This is great for preventing the toasted coconut and chocolate chips from sinking to the bottom. However, they need a little extra time to cook all the way through. Keep this is mind as you choose your heat amount. 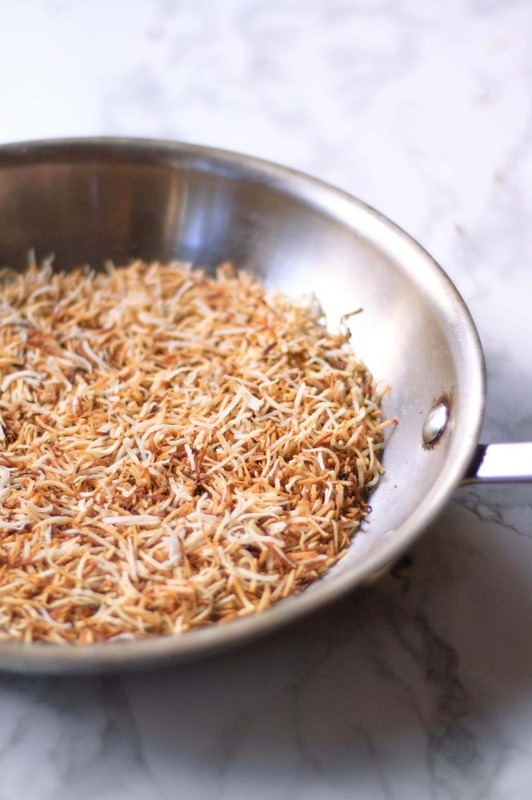 If you like a stronger coconut flavor, make sure to look in the notes section of the recipe for easy substitutions. Also, I don’t recommend using an aerosol cooking spray because it creates a lot of almost invisible buildup. This makes it harder to take care of your pan and get it fully cleaned. 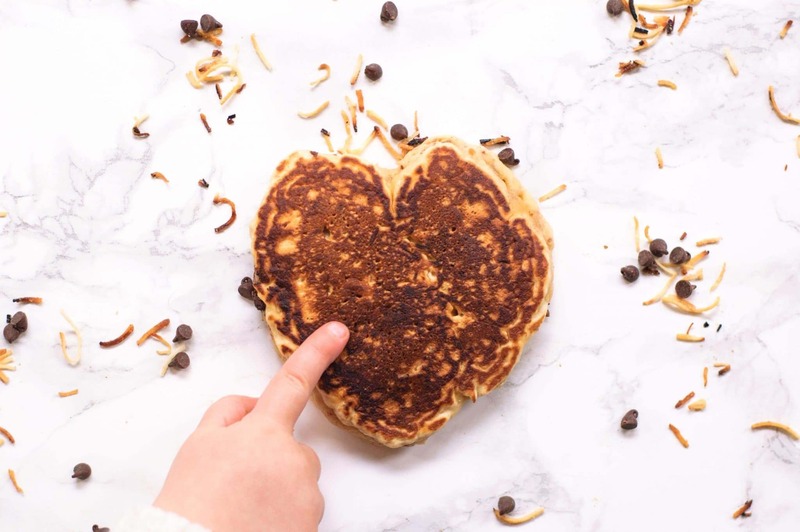 Want a free printable grocery list for this Chocolate Chip Pancakes recipe? Get it HERE. With the addition of two simple ingredients, these chocolate chip pancakes are completely transformed! These easily satisfy a sweet tooth without any additional sugar! In a large bowl sift together the flour, sugar, baking powder, and salt. Stir in the mini chocolate chips and the toasted coconut. In a different bowl, whisk together the egg, milk, and melted butter. Make a well in the center of the dry ingredients and pour in the milk mixture. Use a whisk to mix together all the ingredients. be careful not to overwork the mixture or the pancakes will be tough. Preheat a griddle or pan over medium-low heat until hot. Lightly brush it with some oil or melted butter. Use a 1/3 cup measuring cup to pour out a pancake. Cook for 2 Minutes or until bubbles begin to pop, the pancake starts to hold shape. The pancakes should be lightly brown on the bottom. Flip the pancake and cook for another 3 Minutes, or until the batter is cooked throughout. Transfer to a plate, oil the griddle or pan again, and repeat as needed. Combine the heavy whipping cream, sugar, and pure vanilla extract into a bowl. Use a whisk or an electric mixer with the whisk attachment to whip the cream. You want it to reach "stiff peaks" (when the whipped cream stands up on its own after the whisk is removed). Top the pancakes with maple syrup and a healthy dollop of whipped cream. Serve. Replace the butter with coconut oil. Replace the milk with coconut milk. Use coconut oil in place of regular oil when greasing the griddle or pan. This looks delicious but you presented me with a conundrum. Should I make this for dessert or as a decadent breakfast. Nice job. This is making me seriously hungry. Who doesn’t love chocolate and coconut? Oh yum! What a decadent treat for a special breakfast….maybe a birthday or holiday celebration! I’m a HUGE fan of toasted coconut and chocolate so these make me happy! ? Coconut is one of my favorite ingredients and I absolutely LOVE it toasted 🙂 Maybe it’ll start to grow on you! These pancakes look delicious and I love all of the techniques you shared. Thanks so much for all of this! I would love for it to start to grow on me Sarah. It always smells so good – it just never tastes as good as it smells. Kind of like Folger’s coffee… 🙂 Thanks for checking it out! Yummy as always, Mack! I only eat breakfast properly on weekends but you’re tempting me to change that. And that shape is cute! Soooo good!!! Best pancakes ever. Yay!!! I am so glad you loved them Oliver. They are such a fantastic mix of flavors without being overly sweet. Love toasted coconut! These look delicious! I will definitely have to try them with my kiddos this weekend! Yes! It is definitely a family favorite in our household!